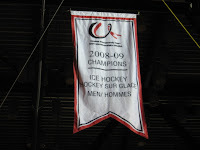 The V-Reds raise the 2008-09 championship banner tonight to open the new season with the UPEI Panthers providing the opposition. Last season, UNB went 3-1 vs the Panthers, with the only loss coming, ahem, in the season opener, 4-3 in OT. The game will be available on Rogers TV (set your PVR to watch it again!) as well as News-Cast.com ($5.95) for those of you lacking a television. Game time is 7PM. "Before the game UNB Hockey will do something special while celebrating the 2009 National Championship. This "event" has been done once at Madison Square Garden and once at Rexall Place in Edmonton. For the first time it will be done in the CIS. The first fan who emails me at vredsvideo@gmail.com with the correct answer will win a special VREDS Hockey Prize Pack. If you know the answer please keep it to yourself so we can continue to build excitement in the community. Thanks for being great fans and looking forward to seeing everyone out to celebrate one great season and get ready to start another." Don't forget to check out Bruce Hallihan's 2009 AUS Hockey Preview in today's Daily Gleaner (follow the link and scroll down for team write-ups). This has become the "bible" of AUS prognosticators, and it's always a great read. The 2009-10 season is here. Go Reds Go! Isn't News-Cast broadcasting all of UNB's home games this year for free? It certainly looked that way a few weeks ago, but at the time of this posting their site has been updated and it it looks as though there is a charge of $5.95 now. They were free for awhile, but I guess things have been updated and they now cost $5.95. I'll have to update my site. UNB is on a 20 game home openner win streak going back to the 88/89 season when they lost 5-6OT to SMU. The last time UNB openned against UPEI at home was 96/97, UNB won 5-4. UNB's game one record (over the past 35 years) is 12-4 at home, 6-11-2 on the road for a total of 18-15-2. Under Gardiner, it's 5-3-1 (4-0 at home & 1-3-1 on the road). Gardiner told me he's never lost a home openner during is entire coaching carrier.